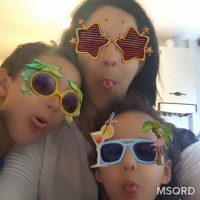 My son discovered the Beyblade Burst series on Netflix last year and quickly became fan. A friend of his had some blades already and he was able to give them a try. Needless to say that he quickly came back asking to get some to play with us. 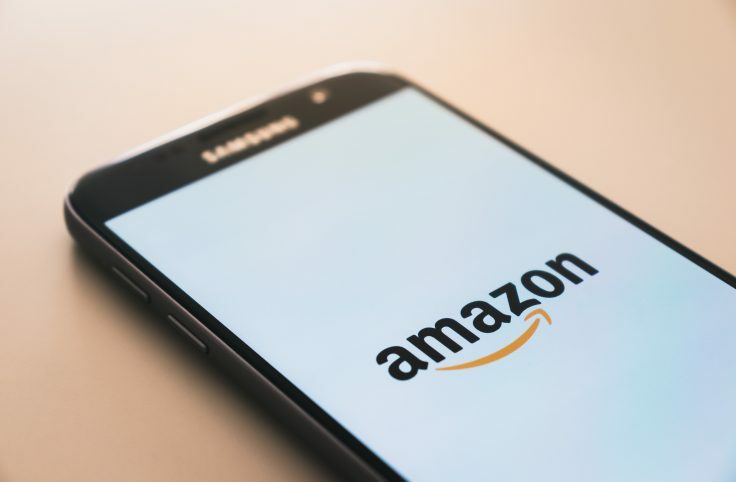 We first starting by checking Amazon and ebay, but the range of prices and all the models didn’t make any sense. After some intensive research, we chose to invest in a couple of Hasbro Beyblade burst and haven’t regret this decision since! We have spent a lot of hours battling against each other, cheering for our blade, trading parts and learning strategies. It has become a daily routine. And guess what? My son is a not the only fan anymore. Although the game is not that popular in the UK, it has a large audience worldwide. They even had the first Beyblade Burst World Championship in 2018! 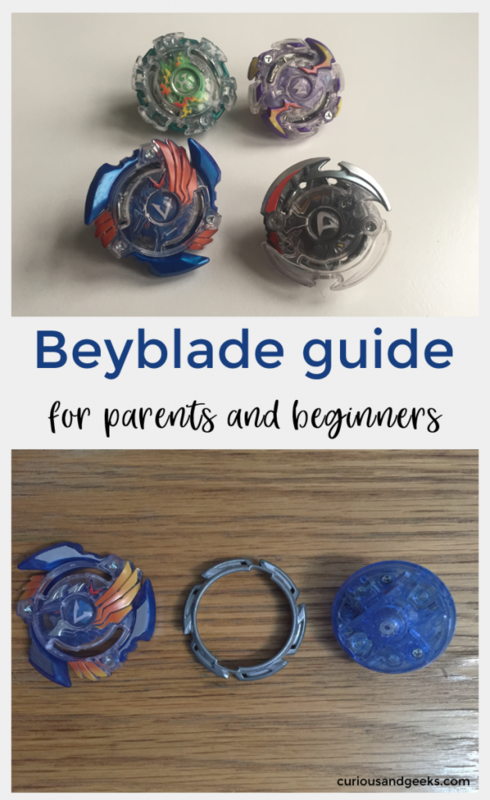 With all the time spent researching and playing, we thought we would put together a Beyblade burst guide, to help parents but also beginners learn more about this game. Beyblade is not a new game at all. In fact it was launched in Japan in 1999 by Tomy. A first series was launched as a marketing strategy to sell more blades. Beyblade Burst is the third generation of Beyblade. It introduced the Burst finish, a new way to win games by exploding the opponent beyblades. The season 1 of the anime is available in Netflix. It follows Valt a young passionate blader trying to reach the World League. The Beyblade burst toys are very close to the ones in the anime and have similar names. Two brands are allowed to sell official Beyblade Burst toys: Takara Tomy, the historic Japanese brand and Hasbro. Although the Takara Tomy blades are released earlier than the Hasbro ones and are more powerful, they are not authorized in several tournaments. Energy Layer: This piece is the one that will get in contact with your opponent when the two beyblades collide. Forge Disc: This ring affects the weight of the bey and its movement. It comes in different shapes and weights. Performance tip: This is the component that will be in contact with the beystadium. Its width will play a significant role in the speed and stamina of the bey. The great thing about these components is that you can swap them around. These are four models we have at home. As you can see in the picture below, the shapes of the components can be very different. You can choose between 4 different types of Beyblade: attack, stamina, defense and balance. 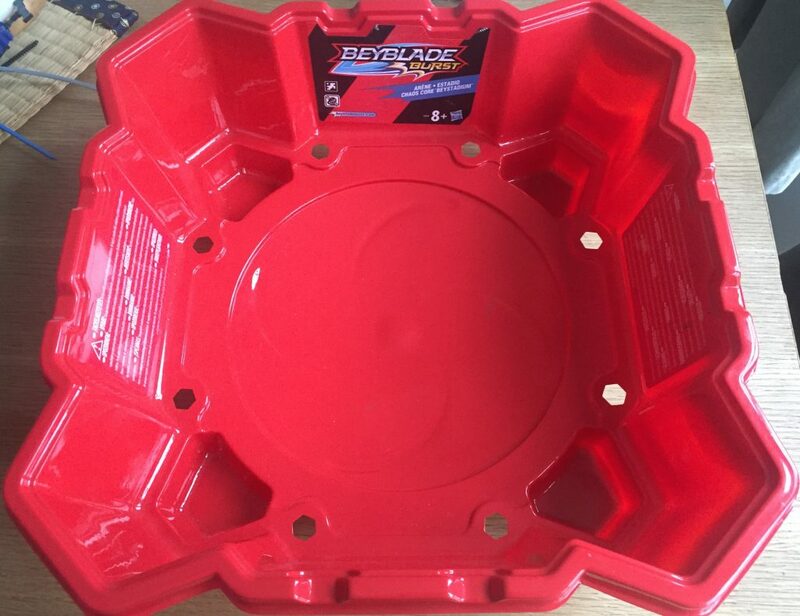 The attack type beyblades have a flat tip to allow for a bigger contact zone with the beystadium. 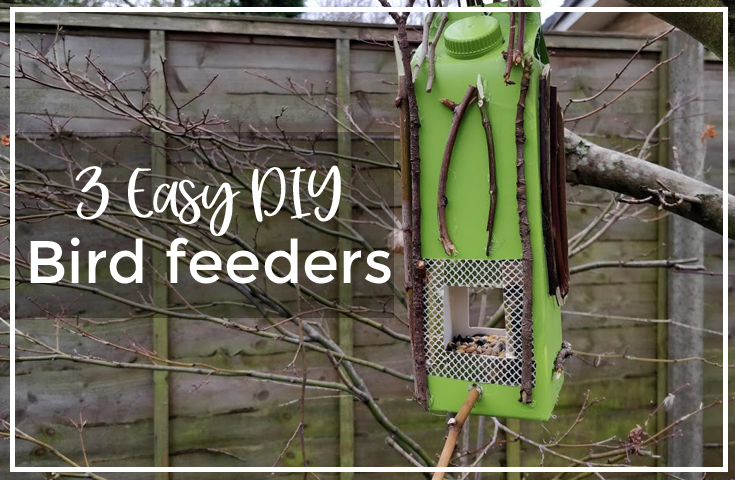 That helps them be quicker and more mobile than other tips. The speed allows for a bigger impact when the beyblade collides with the opponent one. But this comes with the downside of a faster speed reduction. Their forge disc weight is not spread regularly, leading to unpredictable and aggressive moments. The energy layer also play a significant role as it is usually serrated making it easier to grip the opponent and lead to a burst finish! Can you recognize the attack type blades in the picture above? Valtryek is a famous attack blade and is the one used by the hero of the series Valt! It’s the blue one in the picture. Doomscizor D2 is also an attack blade. It’s the grey one with a D.
Then come the defense type beyblades. To reduce the impact of the choc with the opponent beyblades, the defense type are the heaviest. Their energy layer is usually round and smooth, making it harder to grip for the opponent. 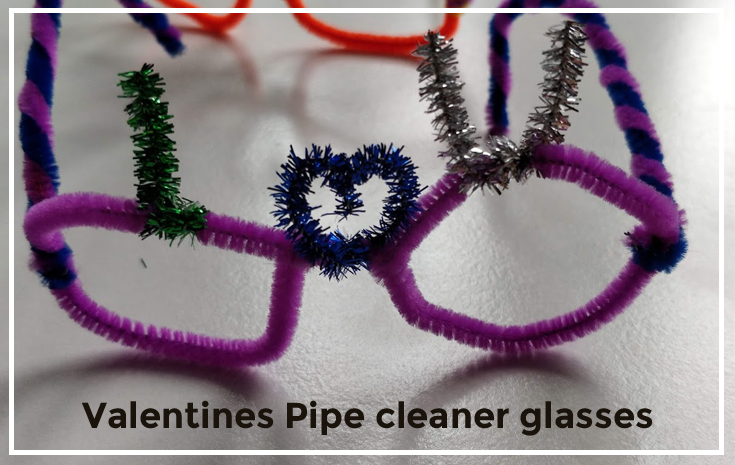 And their tip can be round or can come with a ball bearing system to allow for a high stability. Kerbeus K2, the green energy layer and Wyvron W2, the purple are two defense type blades. The stamina type beyblades have a thin tip to limit the friction between the blade and the stadium. This characteristic will help them keep their rotation’s speed for a longer period. Their forge disc weight is evenly spread, ensuring a very high stability. Wyvron W2 combined with a specific disc (Jerk) and a specific Performance tip (Gyro) would be a stamina type. 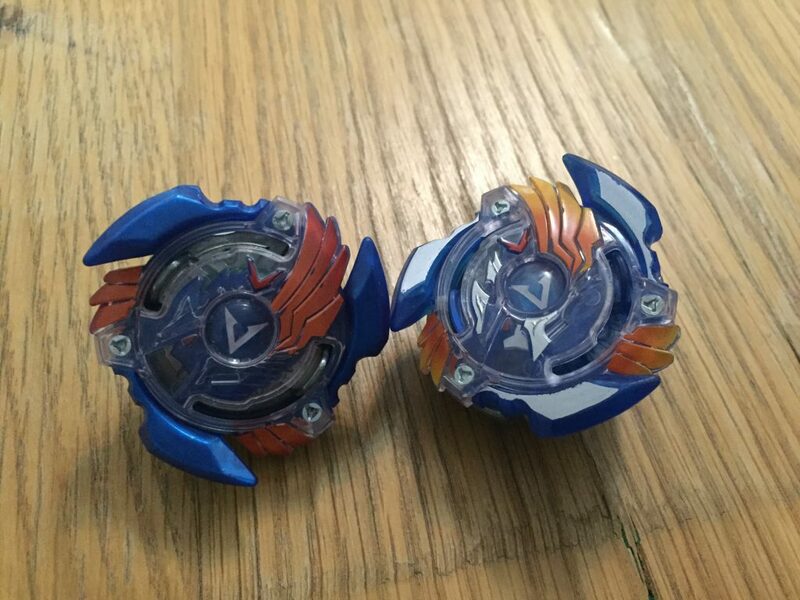 Last but not least come the balance type beyblades. 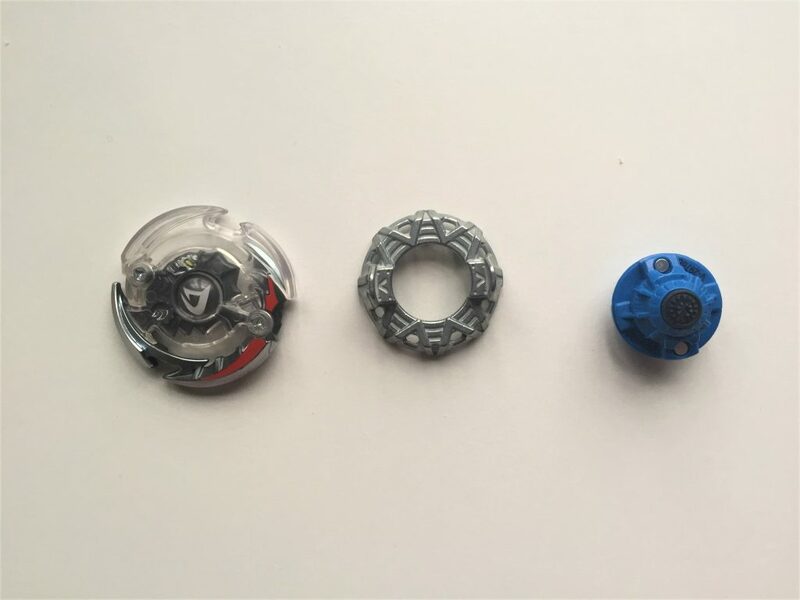 These beyblades combine elements for the three other types, making them more versatile. You could mix up the tip of a stamina type, with a defense forge disc (for a heavier weight) and add up a serrated layer. 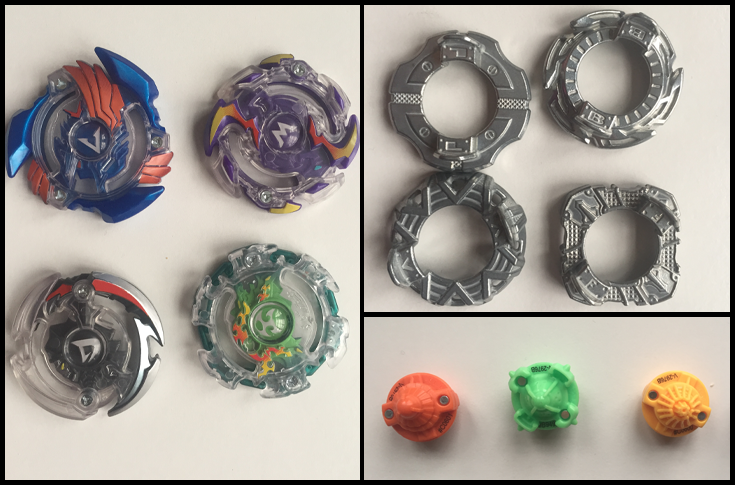 There are more than 5000 combinations according to Hasbro, so you can end up with some pretty unique beyblades! We fell in love with this game because the outcome of the battles can change every time. As soon as we change a single component of our bey, we can immediately see the impact on the next battle. And that’s great fun to try some sneaky combinations. We can throw 2, 3 or 4 blades at a time depending on who wants to play. 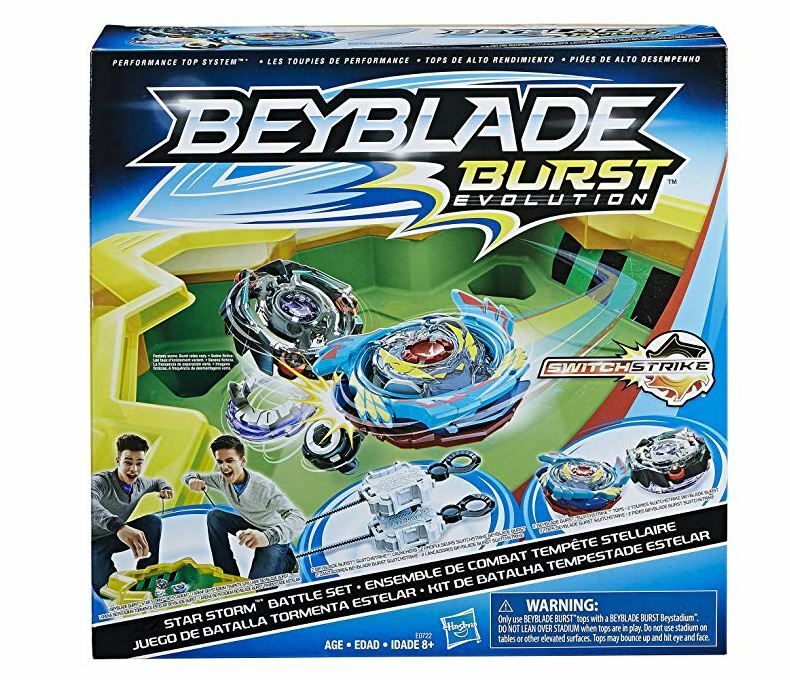 In addition to the two battling beyblades, you will need a stadium and two launchers. The Beystadium is the arena where the battling happens! It is needed to ensure the fight is contained, otherwise, the beyblades may never collide. It comes in several different shapes allowing for different outcomes. Ours for instance, does have four pits in the corners where the blades could get bumped into, which is the other victory condition that attack beys would look for (other than bursting their opponent). The middle circle also has a slightly bumpy shape to force beys to move in the stadium, so even stamina or defense type would interact with their opponent. Although it is possible to launch the blade with your hand, it’s better to use a Beylauncher. It will allow for powerful launches and tricks. By the way, it is possible to attach one launcher to another. Your kid will then be able to play by himself and test out some combinations of components, launching multiple beys at once. This Beyblade burst guide wouldn’t be complete without some battling explanations! Make sure there is no one and nothing right behind you – When you are going to be pulling your ripcord, you will be using your elbow and could seriously injure yourself or the person behind you. So check out your surrounding first! If you do have young kids at home, watch out for choking hazard. The performance tip is not very big and little ones could try to put it in their mouth. 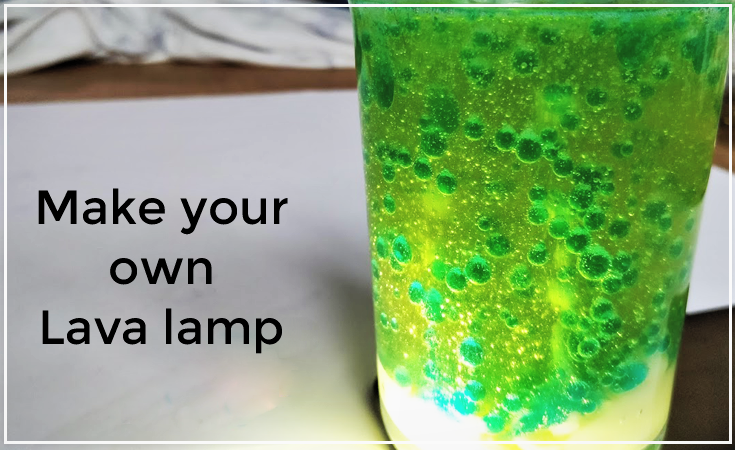 So do not leave them unsupervised. The game is recommended for 8+. Similarly, be careful with the ripcords as they come with an entanglement hazard. Never leave kids under age unsupervised. Wait until all the blades have stopped spinning before getting your blade outside of the stadium. Do not lean over the stadium during a battle (as a bursting bey could hit you). Battle inside the stadium and far away from any breakable items. When the blades burst, one of the part might fly out of the stadium and hit any item nearby. Be cautious with that. Once you make sure everyone is fully aware of the safety rules, you can start battling. Before every battle, you will need to assemble your beyblade, fixing the three components together. 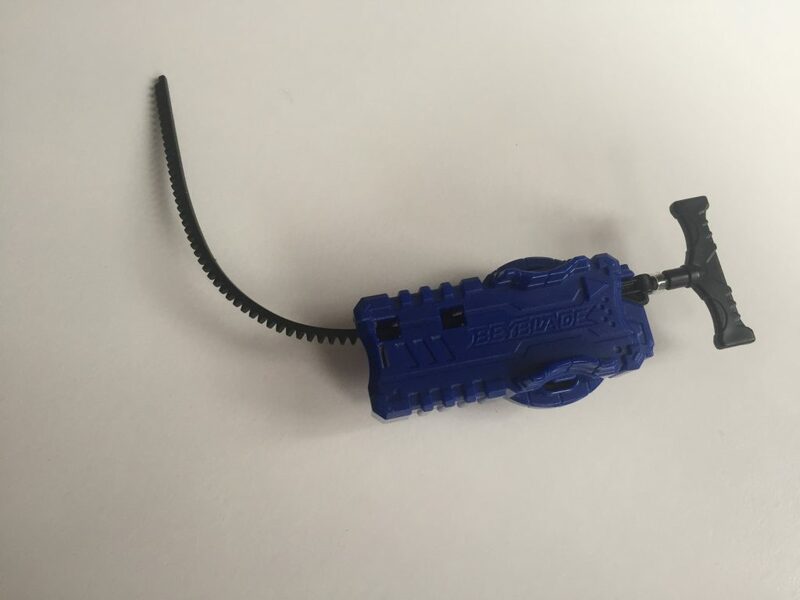 Then you will get your launcher ready, by placing the ripcord into the launcher, putting the blade into the launcher and making sure it is softly locked (it does not fell off the launcher when you let it go). You will hold your launcher on top of the stadium, with your bey directly above it. Finally, once the two players ready, you will pull the ripcord and watch your bey battling for victory! Tradition would also invite you to say “let it rip!” when you launch. Ring out finish: This happens when one of the beyblades is knocked out of the ring or in the Beystadium pits. The player remaining in the ring scores 1 point. Survivor finish: This situation happens when one of the beyblades stops spinning. The beyblade still spining scores 1 point. Mix up your components to customize your beyblade. Try to surprise your opponent and adapt to his types of blades. Learn about the different types of beys to be able to switch during the battles. Check out the strategies section! Know the different types of stadiums: knowing the stadiums will help you choose the right blade. Practice your launches: the stronger your launch is, the faster and longer your blade will spin. Here you will find some tips to help you win your first battles! A good launcher can make a significant difference in a battle. Some allow you to pull a left or right spin which will considerably change the way your beyblade behave. Let’s look at the picture of the Valtryek. If you make this blade spin clock-wise, then it will knock out the opponent blade when the two collide. But if you make it spin anti clock-wise, then it will likely burst the opponent blade. A launcher that gives you the option to choose what you want to aim for, will help you come up with new strategies. Similarly to other games or sports, you don’t want your opponents to know your strategy. So do not always go for the same beyblade, the same launcher and the same launch styke. They will quickly find out how to counter you. There are several launching styles you can choose from, depending on what you are trying to achieve. At the beginning you will tend to launch you beyblade with the launcher level parallel to the floor. If you are using a high speed tip, then your blade will circle quickly on the outside of the beystadium. If your opponent is playing a defense type, staying at the middle of the stadium, you will loose your momentum way faster than him. And when you will collide, your blade will be so slow that it won’t affect the opponent. In this launch style, your launcher will be parallel to the Beystadium’s angle. This launch is a bit trickier than the banking one, as you will have to push you launcher forward while performing a banking launch. Your blade is going to gain more power and spin in a flower pattern. This is mainly for attack type blades as they will be colliding way more often with the opponent blades. This style is similar to the parallel launch but you will be pulling your ripcord slower than usual. Your beyblade will be slower and will move erratically which will make the battle way harder for attack type opponents. These are basic launch styles but you can discover way more launch styles in the series, where bladers have their own special moves! Try to wait until your opponent launched his blade to launch yours. You will be able to see the angle they used and react. You could then aim for landing your blade on top of theirs or with a great angle to make their blade burst. If your kids want to give this game a try, you will have to get a stadium, two launchers and a couple of blades. If you only get two blades, your games will most likely have the same outcome each battle, and will make your experience a bit boring. So you should try to get a couple more, to give this game a real shot. Spryzen S3 is way more powerful than a Spryzen S2 for instance. They will also understand that the best beyblade burst is a combination of existing beyblades. You can probably start by getting a pack which includes a stadium, two launchers and two blades. Then you will buy additional blades separatly. You can get this pack on Amazon. It is at a pretty decent price and comes with two V3 blades. The game is so famous that it had it’s own 2018 BEYBLADE Burst World Championship. It was a championship for the best bladers aged between 8 and 13. 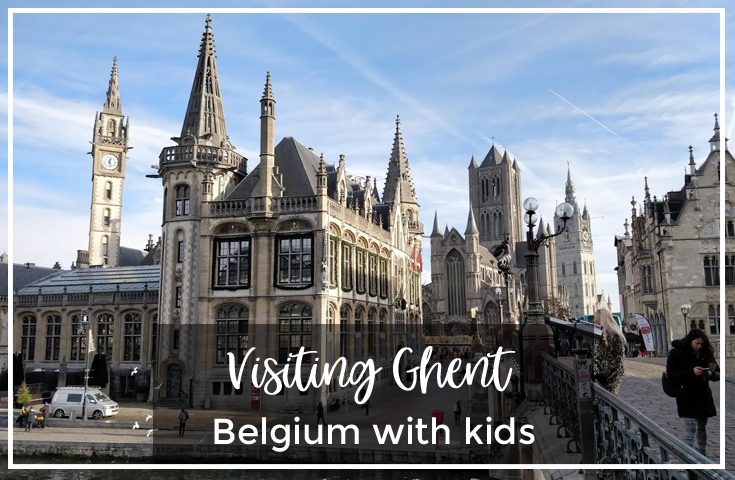 It took place in Paris in November 2018 with 24 countries represented. The winner was Balanced Defender from Latvia. If your kids are dreaming of joining the next World Champion, a great way to practice is to participate in some local tournaments. You will find some listed in the World Beyblade website. 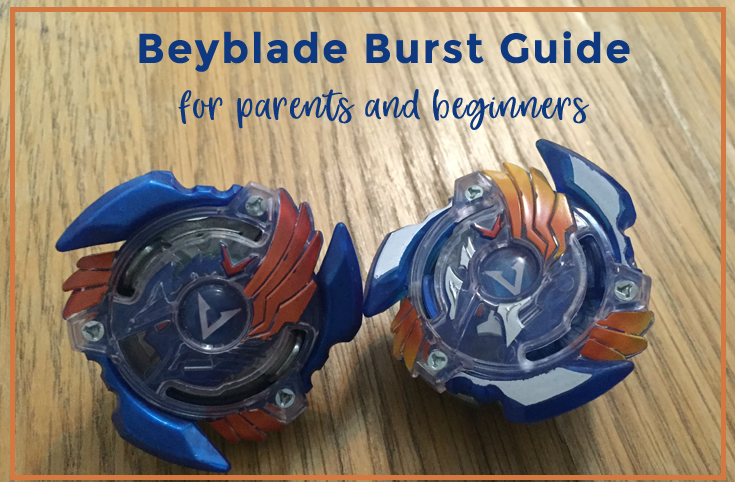 I hope you enjoyed this Beyblade Burst guide and that will be having loads of fun playing it with your kids! 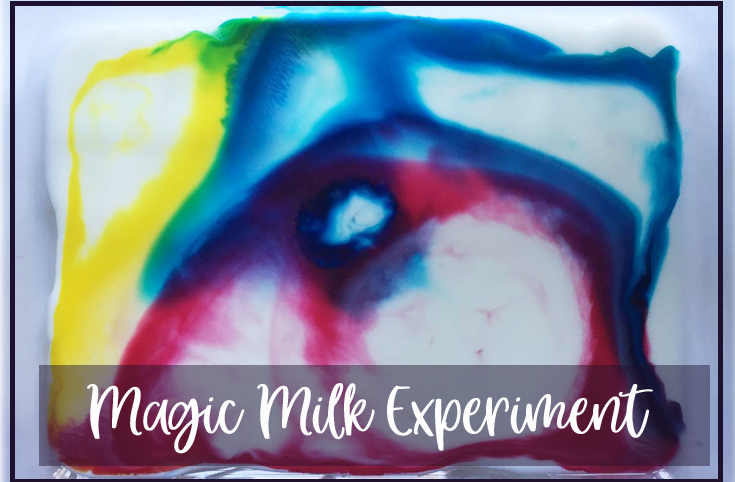 If you are looking of more screen-free activities to do with your kids, check out our favorite board games! This is too funny, it’s like I’m reading my own story. My son who is about to turn 6 just recently discovered Beyblades both at school and on Netflix He is hooked and I have to admit, so am I. Our journey down this rabbit hole began at our local Target. My son asked if he could have a Beyblade. I asked him what it was and he said a battle spinner. So he dragged to the section and I said sure why not it was only $10. I said he could have one and then he insisted you need more than one, to the point I looked it up on my phone and said Ohh you aren’t just trying to con me into more. So we bought two. He is just turning six so he doesn’t have the full grasp of the concept so we didn’t have Stadium and it tooks a bit to figure out the launchers. But once we got our “sea legs” we went out bought a real BeyStadium, few more Bey and we have been fully engulfed. One of the great aspects about this is, once we have been getting into he hasn’t been pestering to use his tablet or our phones, well to scan them into the app and what there Spirit released. This is great fun for him and us.